If the image is black, it is likely nighttime for the Healy. UNH CCOM/JHC will be undertaking a Law of the Sea Cruise on the Healy later this summer. 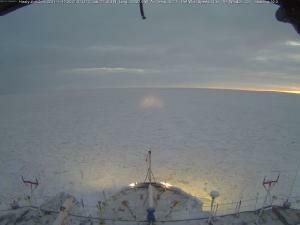 http://www.icefloe.net/healy.html and http://www.icefloe.net/cruisetrack.html are the key web pages for the Healy. 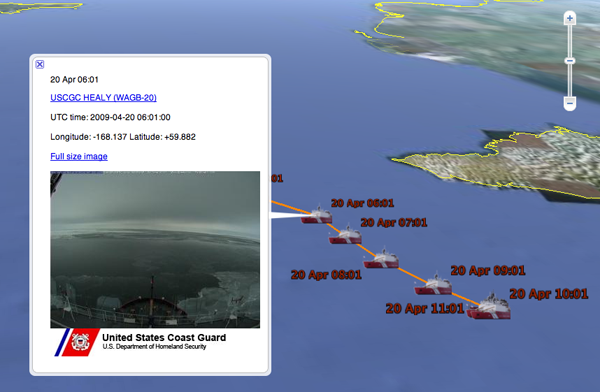 This prototype is an initial implementation of a KML feed for Google Earth of the USCGC Healy Aloftcon camera. 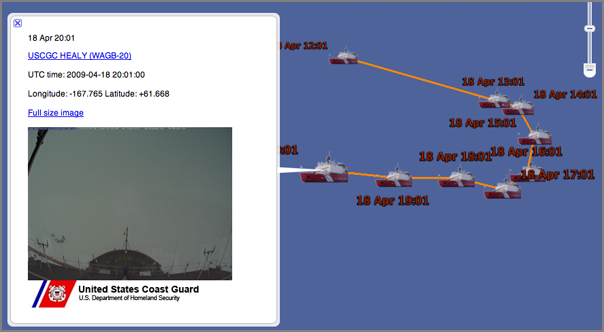 It is a joint project between the USCG, NSF, LDGO, and CCOM/JHC. Use healy-aloftcon-updating.kml to view the images in Google Earth. This file updates periodically get the the latest images. If you view healy-aloftcon-latest.kml directly, you will have a static view that will never update. New images arive every hour from the Healy as long as the satellite link is working. You can also view the news feed of new images with healy-aloftcon-latest.georss. This is my first attempt at creating a GeoRSS feed, so I am not sure that I got the feed correctly implemented.